A capture card with three independent channels of video capture for 3G SDI, DVI and Composite video, with full analogue and digital support. 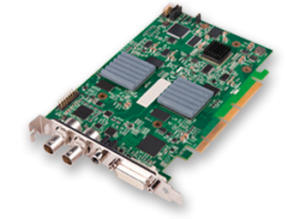 The VisionAV-SDI is a four lane PCI Express card with three video capture inputs - two supporting HD capture and a third supporting SD composite video, these three independent video channels can be captured simultaneously. The VisionAV-SDI also adds multiple channels of audio capture, which can be synchronised in software using timestamping with all video capture channels. The half length full height card features a full mechanical 16 lane connector with notches which will enable it to fit four, eight and 16 lane motherboard connectors. This capture card provides a single flexible card solution for areas such as medical, lecture capture, web casting and video conferencing. * Adapters for other types of video connectors such as DVI/HDMI, DVI/VGA or DVI/Component are not included with the VisionAV-SDI but are available from Datapath, contact our sales team for details.